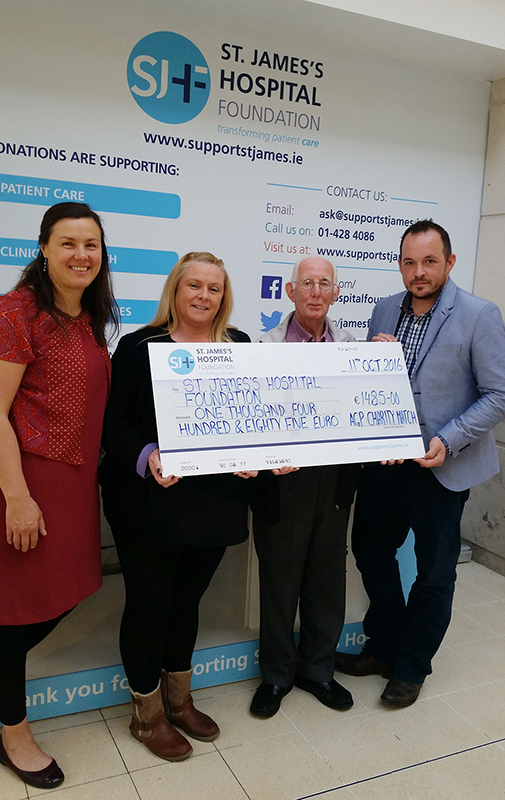 Thank you so much to Rachel and Alan Davidson for presenting us with a cheque for €1,485 for End of Life Care at St James’s Hospital. Rachel’s mother and Alan’s wife, Toni, passed away after a battle with cancer. Rachel and Alan wanted to do something to say thank you for the care that she received from all the team in the hospital, so they organised the Arthur Griffith Charity Match, which saw the old team take on the new team at the club. The match finished with a draw, a very fair score! Well done to everyone who got involved organising or playing at the match and many thanks to everyone who made a donation at the event. From left to right: Bettina Korn (End of Life Care Co-ordinator at SJH), Rachel Davidson, Alan Davidson and Jamie Conway (St James’s Hospital Foundation).